"GREAT FAN PHOTOS AND STORIES KEEP ON ROLLIN' IN! " Over the past few weeks the photos you have submitted have been eye-boggling in terms of rock-n-roll energy and the stories have been mind jarring in excitement. REO NATION has never been stronger. Keep up the good work my fellow fans and one day we shall rule the rock-n-roll universe. 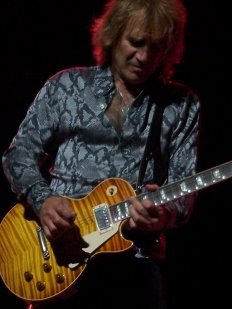 OK .... maybe I went a little too far there ... but my gosh ... good work and keep sending the stuff in ... and you never know ... one day REO/Dave fans may just in fact rule the rock-n-roll world! We start off with John Payne. He sent in some great shots taken at the Counsil Bluffs Iowa Stir Concert Series on June 30 2007. 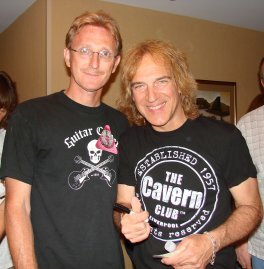 "I met Dave at the Stir Concert in CB Iowa. Great show. I loved talking to him about guitars and guitar stuff. The show was great (and) Kevin kept saying how good the band felt. I ended up with a fan that has seen 43 of their shows. I am a player so I was very interested in Dave's guitars." That is a most excellent shot of Dave playing the "Fender Stratocaster Rory Gallagher Custom Shop Relic" (Top photo; the photo with Dave singing into the microphone.) 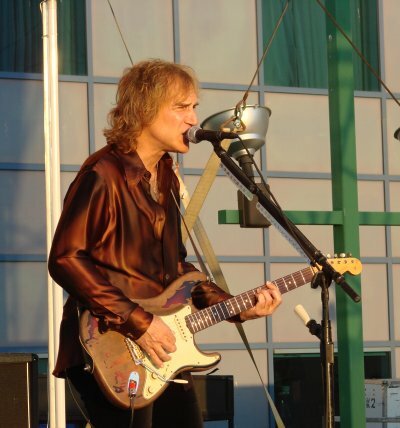 And John, since you are interested in Dave's guitars, be sure to check out the Dave's Guitar Inventory page that webmaster Ken McGee posted a few months back. All the guitars are there. Well ... I think they are all there... unless Dave added another one in the last few minutes. Also note that the Rory is number #26 on that page. Thanks for the submission and your support. You rock John! Photo submission number #2 comes from "Gina." Now ... before you read this note there is a limit on how crazy a story can be before I can't post it. Gina you brought it right up to the limit and you did not go over. Good job. "My name is Gina, and my best friend Holly and I absolutely LOVE Dave! Dave was so sweet when we grabbed him in the hall of the hotel to pose with us for pictures! He stayed and talked to us for a long time. It is the first time we got to meet him and we were awe struck!!! 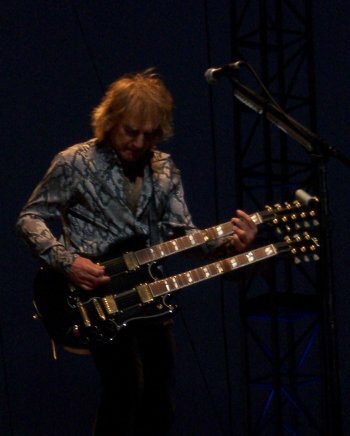 We went to the REO concert in Norman, Oklahoma at the Riverwind Casino on May 4, 2007. Our friends got a hotel room basically right across the street from the casino called the Sooner Legend Hotel so we could party and not have to worry about driving home! Little did we know that REO was staying at the same hotel! We were so excited when we found this out! 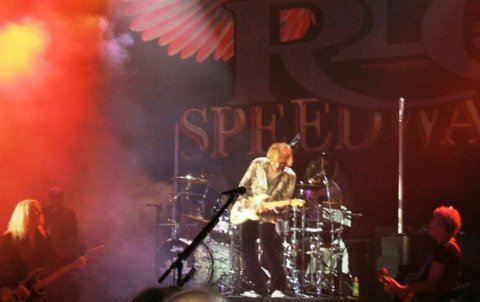 We see REO every time they come to the Oklahoma City area! It is always our favorite concert! It is SO MUCH FUN!!! We will continue to see them every time they come to Oklahoma! Also, we LOVE the new CD! It is fantastic!" Above: Photo of Bruce and Dave jammin' out and a photo of fans Holly and Gina with Dave. Wow! ... Incredible-amazing-thrilling-exciting story of rock fans meeting their favorite rock band! 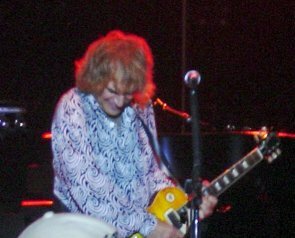 Photo submission #3 comes form "Arno" describing the June 2007 show at the Apollo from REO's recent European tour. 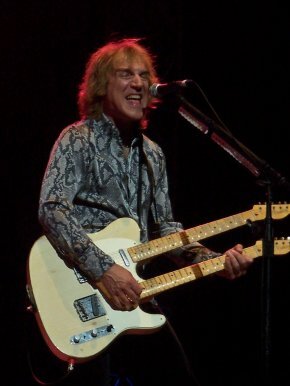 "My name is Arno and I took a great picture of Dave Amato at the Hammersmith Apollo show! I had seventh row tickets, REO played the first four tracks of their new CD Find Your Own Way Home! Awesome! They played the classic hits for which they are famous as well! Can&rsquo;t fight this feeling, Keep on loving you, and also That ain&rsquo;t Love! I love that song! 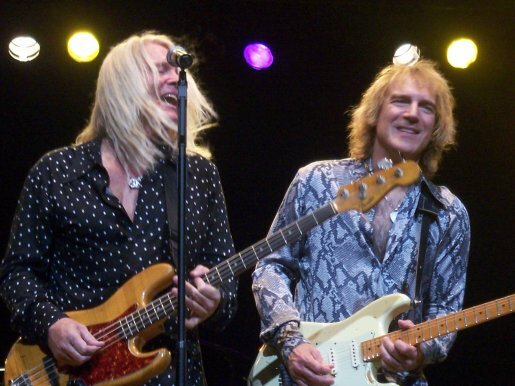 And not to forget the REO rockers! At the encore they played Ridin&rsquo; The Storm Out and also a short version of 157 Riverside Ave And the cover Gloria! I stood at Dave&rsquo;s side and at the encore went to first row! Right in front of Dave! Dave was incredible! His playing was very tight! I love his guitar technique! The guys are in top shape! A very good show, a night I won&rsquo;t forget!" 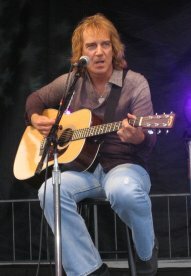 Arno ... wonderful story and photo ... thanks for the submission ... You rock! Photo submission #4 comes from Tita Tucker. 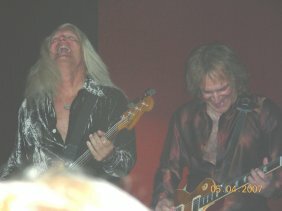 She sent in this nice shot the from the Hog Creek Ice House show in Waco TX taken on June 22, 2007. "The show in Waco was awesome! This was my first time to see the band live and I think they sounded just as good as they do on their CD's. I've been a big fan since the later 70's. 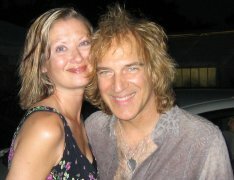 REO Speedwagon Rocks!" 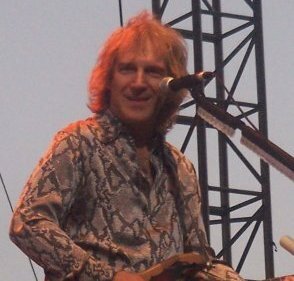 REO Speedwagon Rocks? Since that is the case then Tita .... you are the "Roll" part of it.! Keep on rolling Tita and thanks for the photo and story! 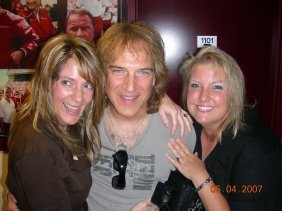 Photo submission #5 was sent in by "Sonia" from the June 27, 2007 show in Buffalo. "I really enjoyed meeting you & the acoustic set you played in Buffalo. The night was great!" Above: Photo of Dave jammin' out on the acoustic and a great photo of super fan Sonia with Dave. Thanks for the submission Sonia! You rock! 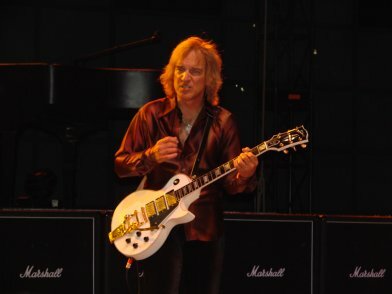 Photo submission #6 comes from Todd Zeidner which were taken at the Del Mar show on June 16, 2007. My Granddaughter Sami said it right. "Soul Moving!!!!" She said it best. The show was so amazing. We were rockin!! 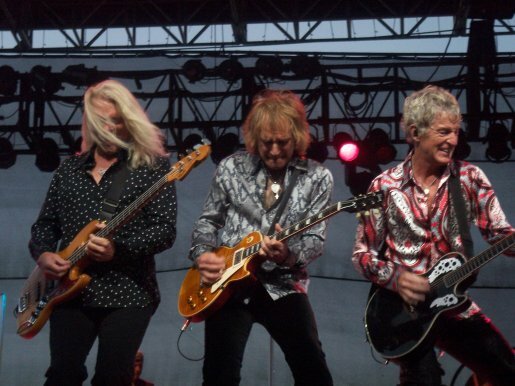 REO just keeps getting better and better every time we see them. I will have more pictures for you and Dave in August. 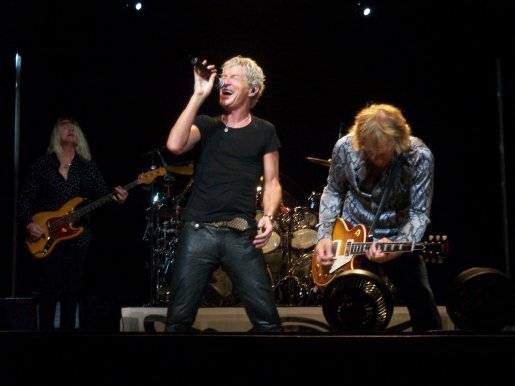 I am going to four REO shows in August." Well if the show was Soul Moving .... then all I have to say is that photos certainly support that statement! Incredible photos Todd! Thanks for the submission, going to four shows in August, and for being not only a Soul Man but also a ... Soul REO Fan! "YOU ARE ALL SO AWESOME !"